I recently attended my eighth Asylum steampunk festival in Lincoln. I didn’t take many photos this year, although I did shoot abit of video, so here’s a quick vid of the event. This year I was field testing my new bioshock inspired mask, although I did also use my steampunk flight mask from last year in the military parade. Also, check out these awesome pics people took of the mask at the Asylum! So I spent the weekend at The Asylum Steampunk Festival. Here’re a few pics of the costume. And here’s the Imperial Æthyric Airways gang. Here’s part two of my video series looking at making a steampunk mask. I’m also making a steampunk revolver, which is the first time I’ve actually had a go at making a steampunk hand gun. This is made from copper piping and some plywood which I’ve covered in plastic, leather and some cast resin pieces made from CO2 cannisters and various other mechanical pieces. I’ve also made some union jack shin guards which are made from foam covered in fibre glass which I’ve sanded smooth. Here’s the first part of my build log looking at the creation of my steampunk mask/flight helmet. I’ve got a little further along in the build than the video shows, but I’ll be detailing that fully in the next part. It’s that time of year when I start working on my piece for The Asylum. I’d actually intended to start working on this in January so I had plenty of time to get it sorted. That’s obviously not happened! This is intended to be a pilot’s helmet for Imperial Aethyric Airways, my friend Sue’s steampunk troupe. As you can see they’re characterised by their union jack livery and it’s high time I joined them, so this will be painted in union jack colours too. And have then covered it in fibre glass and car body filler. After much shaping and sanding I’ve ended up with this. Here’s a rough sketch of how this is going to look – the pipes in the respirator will lead down to a unit in the chest which will have fans circulating air into the mask so I can actually breath (important). The flaps on the side and top of the mask are intended to be aerofoils which will be servo controlled. I’m thinking these will be linked to a tilt switch so that when I tilt my head the servos run through a programmed sequence. I attended the Asylum last weekend, Lincoln’s Annual Steampunk festival. I’m currently editing a video, but here’re some pics in the meantime. As you can see I got to road test my exo-suit arm as well as see some rather amazing costumes made by others. Here’s the final part of my build log for my steampunk exo-suit power arm thing (still not doing too well on coming up with titles for my stuff!). I’m quite pleased with how this came out. The mobility is pretty good and it doesn’t restrict my movement much at all. 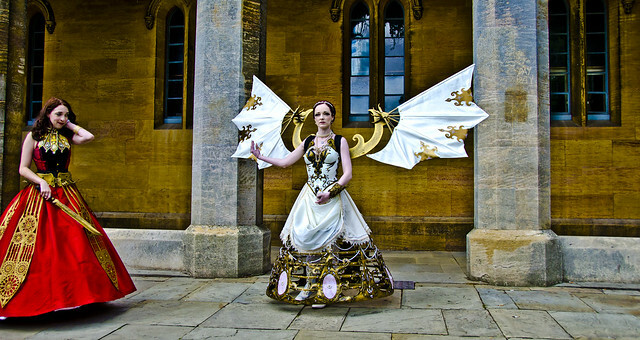 I’m off to the Asylum Steampunk Festival this weekend so we’ll see how it holds up! Just thought I’d share this quick video of my Steampunk Exo Suit which I posted on my facebook page. The piece is basically done, a few more details to take care of but basically there. The Asylum‘s next week so looking forward to taking it out on the road, so to speak. I’m currently editing the final part of my build log which I’ll post soon as it’s finished.